Writing comes easy to me … after I’ve mulled my subject over for a week. In that respect, I have much growing to do. Blog posts are no different, but the time between deciding to write and publishing this one was less than twenty-four hours, and it involved reading an entire book! I signed up for the March Book Frenzy Blog Hop with eNovel Authors at Work organized by Fabulosity Reads which required of bloggers to choose a book cover among the eight titles listed in the Hop Catalog and write a short piece about it. Reading the blurbs, the book that appealed to me mostly was “Flaps Down – The Reluctant Hero” by Jackie Weger. Its cover, however, did not help me with the “branding” angle I had in mind, so I chose Donna Fasano’s Merry-Go-Round and presented it here. But Jackie Weger’s blurb stayed with me for entirely subjective reasons: give me a grumpy reclusive hero who finds himself doing a one-eighty because of a woman, and I’ll drop (almost) anything to read his story. So, I spared the mind-boggling amount of 99 cents and bought the book. I might have somewhat eased my conscience, but with my TBR list looking more and more like the Tower of Pisa, I knew I wasn’t going to read it soon. Well, my three-year-old daughter decided otherwise. She had a rough night yesterday with labored breathing and a hard cough, and, around midnight, I gave up hope of falling asleep needing to keep an eye on her. So I picked up my iPad from my night stand intending to browse a book on self-publishing, but what I ended up not resisting was to peak inside “Flaps Down: A Reluctant Hero”…and by 3.30am I had finished it! Parnell Stillman, ace pilot, is man to the bone in a lackadaisical kind of way. He has the ability to fly through anything except solid mountain. Flying is his high road until one sleet-filled morning—it isn’t. Mischance forces his plane down in a frozen wilderness. He can survive, but his live cargo is another matter–an annoying social worker and five orphans—the most irksome freight he’s ever hauled in his life. Rebecca Hollis is determined to force the obnoxious, disagreeable, self-centered pilot to do whatever is necessary to insure the survival and rescue of the orphans… Even if it means making the noble gesture of keeping her mouth shut—or other womanly things. But the pilot isn’t having it. He’d rather dance with a grizzly or wrestle a puma than give his heart over to a sly, wily do-gooder. He lives alone because people are not to be trusted—especially women. Furthermore, he has no intention of being a hero. No way. No how. No time. Heroics are not his thing. Rebecca has other ideas—lots of them! All artful and disingenuous—one of which is bound to work…she hopes. This story worked in so many ways! First of all, there is a whole lot of adventure; and not the glossed-over, let’s-stir-things-up kind of adventure, but the real deal. The descent of the plane and its inevitable force landing are goose flesh inducing, and the ordeal of surviving in the middle of nowhere through continuous snow blizzards was portrayed in such an authentic and detailed way, I often forgot I was reading a romance. The characters are also refreshingly real and well-layered: Parnell is not only grumpy, he’s a downright misogynist. His stomach hurts when he says something nice to a woman, so he never bothers, especially when she stirs his well-concealed vulnerability. His banter with Holly is witty, surprising and never actually stops even when they admit how they feel about each other. Holly knows how to put this obnoxious lout in his place, but tries with all her might not to cross him too much, as he is their best chance at survival. Touching him though shuts her up completely. But the characters that really shine are the kids: Jonesy, who thinks no one will ever want to adopt him because he is pudgy, Yanse with his imaginary friend who’s a horse, Santee, who’s one quarter Sioux and keeps running away called by nature, Nicholas who can only see shadows but is very cool about it, and Molly who wears corrective shoes, and constantly threatens with tears:”Don’t fuss with me; I’m only five.” Between them who keep bringing Parnell to his wits’ end, and Holly who keeps bringing him to his knees, it’s a wonder he keeps functioning. But not only he functions, he turns into a hero that warms everyone hearts. Even Ms Weger’s choice of using everyone’s POV interchangeably (a “subjective omniscient” to throw in the literary term) which is not common in romance, works perfectly, as everyone is in everyone’s presence all the time. Jackie Weger’s writing is stellar. I read the most unexpected turns of phrase with a “dated” feel which, nevertheless, didn’t feel out of place as well as some very original bodily cues. “Oh,” she replied, presenting an arabesque of indifference. Nice! All in all, I’m so glad my conscience was nagging me and I revisited this title. I’ll surely check out other titles of this wonderful author. 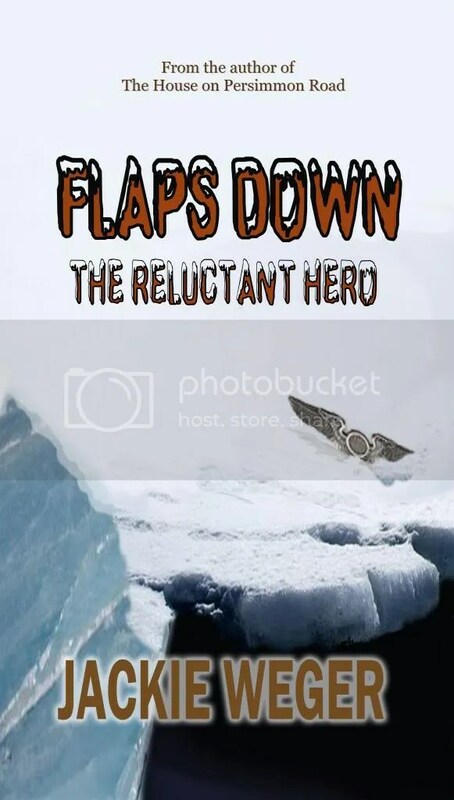 You can download “Flaps Down: The Reluctant Hero” while it’s still on a countdown deal from Amazon. Read a delightful interview with the main character, Parnell Stillman, here. COUNT DOWN DEALS ON THE HOP CATALOGUE. 2 featured e Books from each author. brilliant. brilliant. brilliant. ‘Nuff said. I’m sure Jackie will be thrilled. Wow! M.M.Jaye! What a fabulous and charming review. Gosh. My appreciation knows no bounds. I thank you and Parnell Stillman thanks you. You mentioned the cover. I know it is not a slicked up cover. The book may get one later, but I have to tell you. The cover designer is a guy and he read the book and made a cover that looks the way Parnell wears his clothes. Scruffy. I could not resist it. LOL. Again, Thank you! Your review is a treat to read. All authors should be so lucky. This review is so compelling that Jackie’s book is going to be a must-read for me. And I’m already suspecting that it will sneak way in ahead of most if not all of the books on my TBR pile. Thanks M.M. Jaye for your wonderful review and also for your support of our March Book Frenzy! The pleasure was all mine! Thank you for stopping by, Dianne, and good luck with Quintspinner! It’s very kind of you to let both Jackie and me know, Mary. I’m sure you’ll enjoy it! All the best to No More Mulberries! Excellent review. I love to find those books that you just can’t put down. Sorry that you found yours in unfortunate circumstances and hope your daughter is feeling better. She’s much better today, thank you, Julie! It was the best way to pass an otherwise worrisome night! Thanks for stopping by! Seriously though, Jackie’s book (and most of her books that I have read) have a quality of both professionalism and style that transcends their genre. I would have no problem recommending Flaps Down to almost anyone who was a reader in general, not just a romance reader.